The Effect of the Great Lakes "Spring and Early Summer Weather"
"Spring and Early Summer Weather"
The Great Lakes of North America were formed about 10,000 to 12,000 years ago from glaciers that carved deep troughs into the continent. 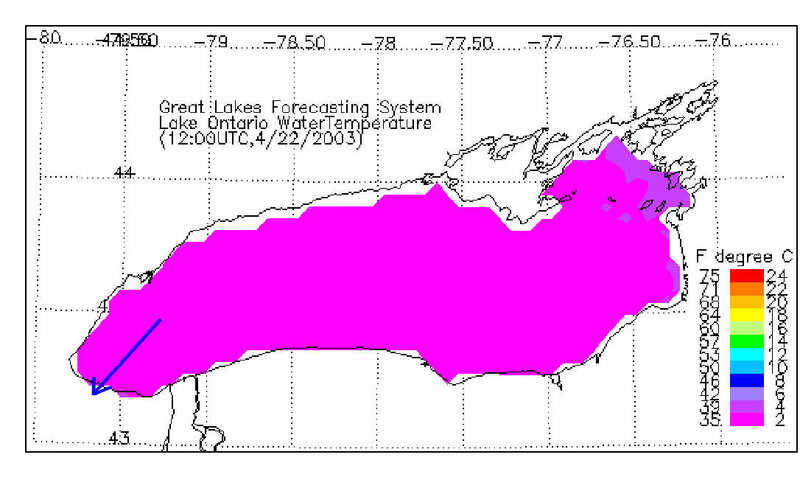 Ice sheets remaining in these troughs melted and formed Lake Superior, Lake Michigan, Lake Huron, Lake St. Clair, Lake Erie, and Lake Ontario. (Eichenlaub 1979, p.5). The period when the lake is cooler than the land is known as the stable season. When the lake is warmer than the land, the period is called the unstable season. When the lake is cooler, evaporation rates are lower, and lifting is reduced by a temperature inversion. This means that air temperatures near the surface of the lake are cooler, and the air actually warms with increasing height, rather than cooling. Local high pressure dominates the region. (Eichenlaub 1979, pp. 100-102). The unstable season is the reverse of the stable season. The lakes are warmer than the land, evaporation rates are high, air is moist and buoyant, and as air rises, clouds form, and precipitation occurs. Low-pressure systems can intensify over the warm lakes. During the stable season, air masses passing over the lakes can produce fog. 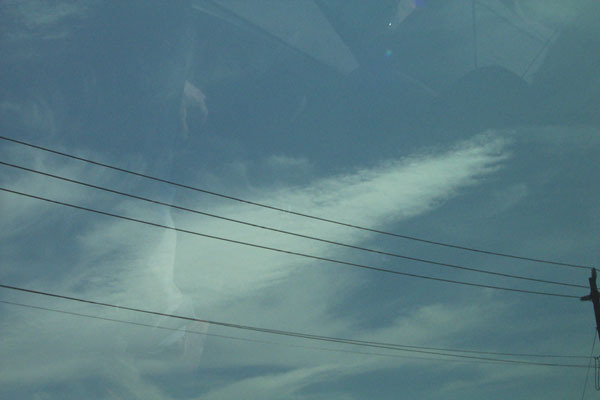 Air originating in the southern United States can be very warm and moist already, then when it passes over the cold lakes, it condenses, sometimes forming thick fog banks known as advection fog. (Martyn 1992, p. 41) This fog is transported over the shoreline in lake breezes. The Lakes cool slowly in late Autumn and early Winter, but eventually their top water layer falls to around the freezing mark. As the year moves into Spring and Summer, the Lakes are also slower to warm, remaining relatively cold compared with daytime air temperatures over land. When the wind blows over the cold lake waters, its air temperature is reduced, providing natural air-conditioning with the onshore flow. In addition, the temperature contrast between land and lake may produce afternoon lake breezes -- cool winds that blow inland from the lake. If you live along the Great Lake shores, the phrase "cooler near the lake" is commonly found in local weather forecasts. Shoreline temperatures often drop 10-20 degrees cooler than sites farther inland when onshore breezes flow. The cooler lake waters also inhibit the growth of afternoon cumulus clouds over them and along the windward shore. Summer satellite observations often show the Lakes and shore regions free of clouds while the surrounding land is dotted with popcorn cumulus. As well, the cold waters may act like brakes on thunderstorms moving out over the lakes by knocking out a prime energy source, strong daytime surface heating. 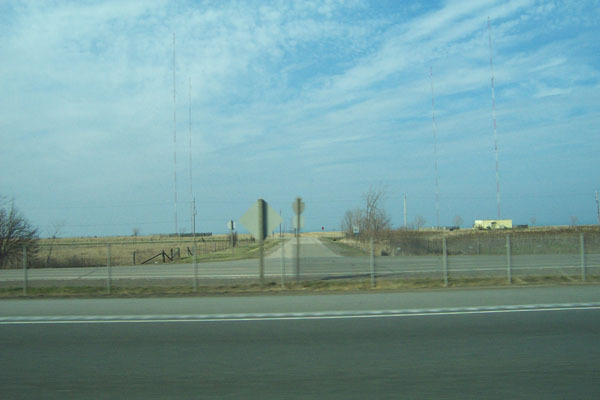 While down in the Niagara peninsula on April 20th 2003 I was shown first hand the drastic effects that our Great Lakes actually have on surrounding land masses. Following a long and cold winter and mild early spring, Lake Ontario's water temperature is taking time to heat up. Since water is such a great cold/heat absorber a large lake, such as Ontario, can greatly modify the weather around it's coastline. On warmer days the cold water in turn cools down the surface air temperature over the lake creating drastic temperature differences along its shoreline. As was the case on April 20th, where I encountered a 20 degree change in temperature over a short distance of 15 km. 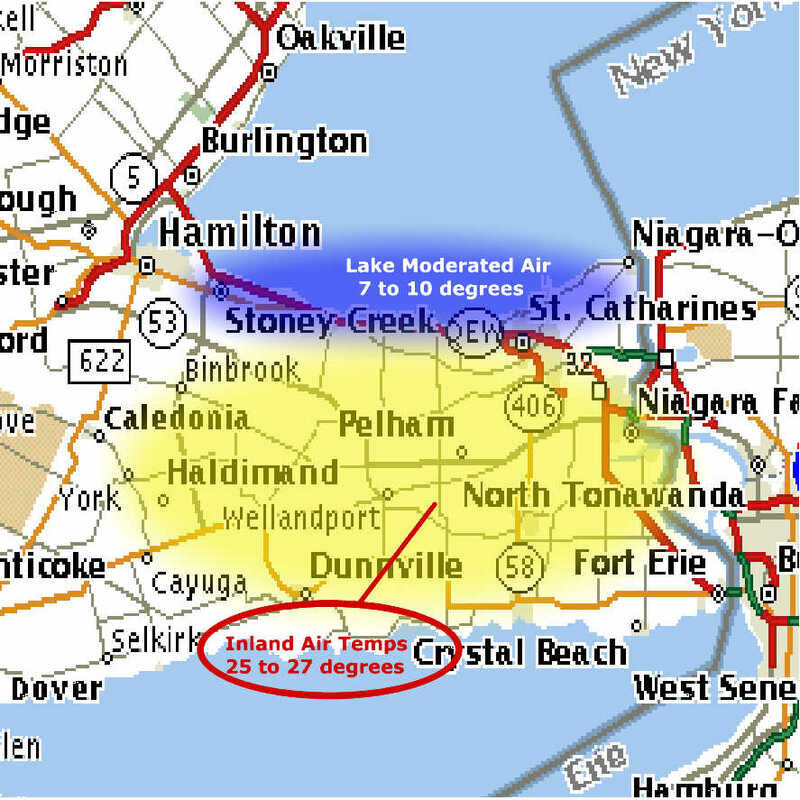 While traveling from Brock University (south of St. Catharines, on top of the niagara escarpment) to Stoney Creek (On the south shore of Lake Ontario, below the escarpment) temperatures dropped from 27 degrees to 7 degrees in a matter of minutes. The average water temperature of Lake Ontario at the time was around 2 degrees celsius. The 25 degree difference in air temperature relative to the water temperature therefore created ideal conditions for the "Oasis Effect". NE to S lake breezes off the Lake Ontario provided sufficient onshore flow to drastically reduce shoreline temperatures. However, once inland, the cool lake breezes were constrained by the Niagara escapement. On top of the escarpment at Brock University the temperature was a steady 27 degrees celsius. 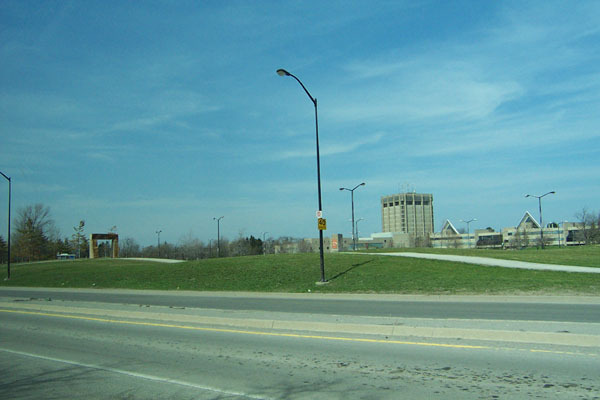 Although Brock is only a few km's from the lake shore the Niagara Escarpment serves as a lake breeze barrier. The cold dense air is not able to rise above the escarpment therefore the area is rarely effected by spring and early summer lake temperatures. Lake breezes have been known to travel as far as several hundred kilometers inland when topographic conditions are ideal. Below the escarpment lake breezes greatly modified conditions. While driving on the 401 paralleling Lake Ontario I recorded a steady decline in temperature until finally reaching 7 degrees celsius in Stoney Creek. 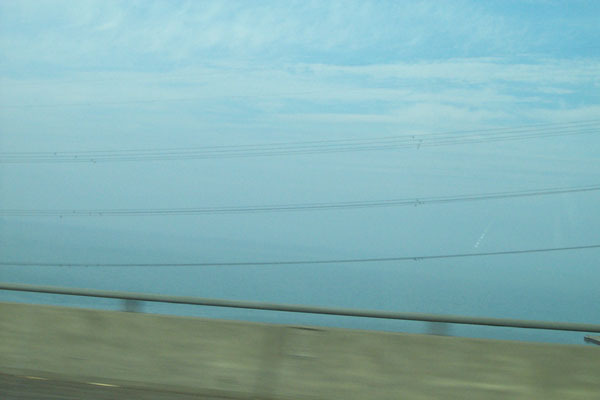 Note the advection fog over the lake in the picture below. In fact this stretch on lake shore is one of the few regions in Canada where grapes are grown. The major reason why they can be grown is due to the "Oasis Effect". Cirrocumulus Cloud Ice cloud. Precipitation possible within 15 to 20 hours if wind is steady from NE to S. Early summer A.M. could mean afternoon thundershowers. Other winds could bring overcast.